Scientists may still be discussing what caused the disappearance of the once-dominant dinosaurs, but there is no doubt among any of them what is causing the current round of mass extinctions. It is mankind. People have been cutting down forests and polluting water and land for centuries, but it is the burning of coal, oil, and gas that has brought the planet to the brink of disaster. As ice melts, storms get more violent and deserts spread; our major cities now face being overwhelmed by the elements. The denizens of Earth may have less than 10 years left to prevent global warming from getting out of control. If we fail, millions of lives will be wiped out before the end of this century. Our world leaders have been warned repeatedly that time is running out. Most acknowledge that there is a problem and make fine speeches, but no economic power is doing enough to avert disaster. Yet . . . There is hope. The technology, the know-how, and the money exist to prevent this from happening. All around the world new ideas and inventions are paving the way for solutions to the crisis. In Brazil more than half of the cars run on ethanol; in Denmark government and industry are working together to harness wind energy, which brings 3 billion euros each year to their economy; and in Japan, the effort to combat dependence on oil has been continuing for over half a century. 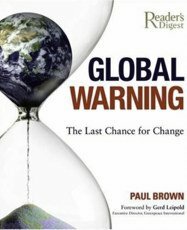 Author Paul Brown has 16 years' experience as the environment correspondent at The Guardian newspaper and presents persuasive up-to-the-minute scientific research about global warming and climate change in a form that is easy to comprehend. More than 300 amazing photographs and maps from around the world illustrate the plight of wildlife, industrial disasters, coastal erosion, disappearing glaciers, and more. Every one of us can play our part. We can switch off the lights, leave the car at home, and vote with our wallets to pressure companies and force governments to change. This visually enticing and hard-hitting text presents proof that global warming is a real and impending threat to the entire world. Global Warning: The Last Chance for Change not only promotes understanding and insight into the complex issue of climate change but even more important, it delivers a clarion call to action by showing how each of us can do our part to save the planet.